Cut cauliflower from its thick stem and cut into medium size pieces. Grate into rice in a food processor in two batches, using the metal blade, not a grater disc. Heat olive oil in a large frying pan and add grated cauliflower. Cook on medium heat, covered for 4 minutes, then stir and add 1/3 cup water. Cook covered for 4 more minutes. Add more water if necessary to prevent sticking. Stir in the remaining vegetables and salt. Cook covered until the vegetables begin to soften, about 4 more minutes. 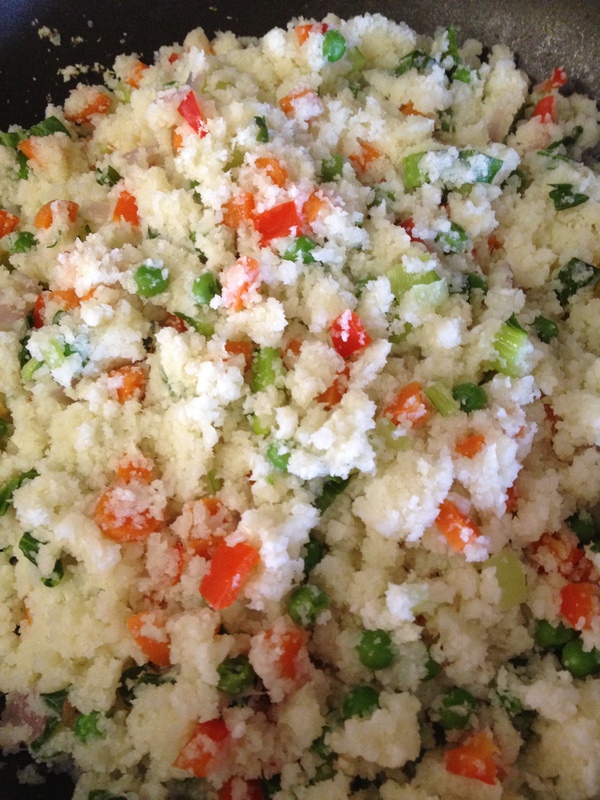 Makes 4 – 8 servings depending on the size of the cauliflower.